Windows based mobile inspector tool gather all information of your Pocket PC mobile phone including phonebook details with contacts, SMS status with date and time in a few minutes. Windows based mobile surveillance application can save all detailed information of your Cell phone in text file formats for further reference. 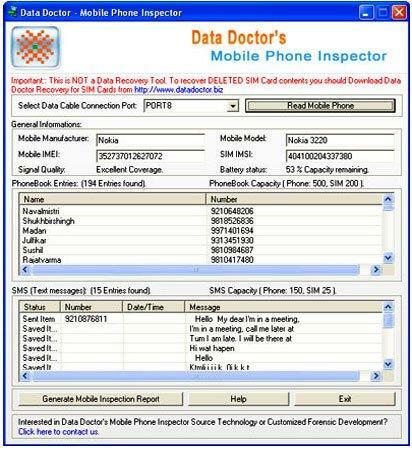 Mobile Phone inspector tool provides detailed information of cell phone such as battery status, signal quality, IMEI number. ...... Mobile manufacturer Name, Mobile model number, Sim IMSI number Mobile IMEI number and Signal quality from all major symbian OS-based Nokia mobile cell phones and other supported mobile phones. Mobile phone investigating tool is freeware available, but user needs to pay only if software is required with the source code. Mobile investigation software is the reliable tool for getting all useful information about mobiles phone and the sim card. Mobile phone inspector software is very useful tool for scientific investigation of mobile phone information. Software generates report of all the information fetches by the user in a text file for user future reference. Software provides user friendly GUI interface with easy to use environment (for non technical persons). Qweas is providing links to Mobile Phone Inspector 2.0.1.5 as a courtesy, and makes no representations regarding Mobile Phone Inspector or any other applications or any information related thereto. Any questions, complaints or claims regarding this application Mobile Phone Inspector 2.0.1.5 must be directed to the appropriate software vendor. You may click the publisher link of Mobile Phone Inspector on the top of this page to get more details about the vendor.